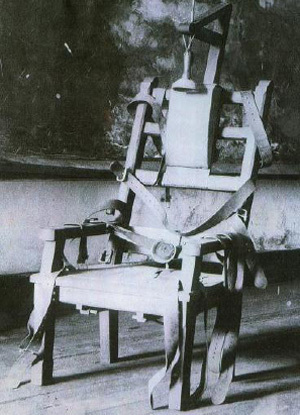 First Electric Chair: Edison, Co.
Dr. Alfred P. Southwick, a pleasant dentist from Buffalo, New York, had witnessed a drunken man being accidentally electrocuted. He noted that the shock had delivered a quicker, less painful death than more popular gorey practices, the least grisly of which were strangulation with an iron collar, hanging and beheading. 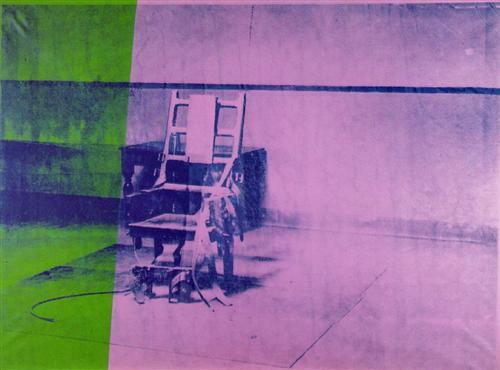 What followed was the invention of the electric chair. "Woah," doesn't quite cover it. "Jesus Christ!" might be an appropriate response. But, if you didn't want to holler the Lord's name in certain company, reactions could employ a similarly avoidant linguistic tactic called a minced oath. Cheese and Rice, Jiminey Cricket, Gee Willikers, or Bejabbers could stand in. The general category of silly words or phrases that act in place of actual, dictionary-approved ones provides an opportunity to be indirect, diplomatic, disrespectfully (some feel) distant from religious or historic significance. It is a privileged fact of our complex language that we can say something other than exactly what we mean, and it can be mutually understood. English has no authoritative body governing "correct" usage, unlike French (Académie française), Italian (Accademia della Crusca), Icelandic (Íslensk málstöð), and Spanish (Real Academia Española). But what happens nonetheless is that the more the silliness is agreed upon, the closer it comes to being absorbed into the vernacular. I'd like two scrambled eggs on toast, bagel on the side, please. This practice has a long history. In Greek mythology the king Rhadamanthus imposed on the Cretans the law that men should not swear by the gods, but by the dog, ram, goose, and plane-tree. In Shakespearean England, swearing on stage was banned, and thus all parts of the deity's self were covered by minced oaths: 'swounds (God's wounds), 'struth (by God's truth), 'sfoot (by God's foot), and gadzooks! ("God's hooks," referring to the nails in the cross). Nicknames, euphemisms, minced oaths - a sprightly hop away from a direct expression of reality. In our least palatable efforts, we employ them to obscure abhorrent fact. Alternately, they act as an important reminder that there are multiple ways to express reality; language, and therefore meaning, are malleable. Humans are both figuring everything out, and making it all up, as we go along. OSLab celebrates this.